Army green Zara jacket, Gold Chanel pin, Light pink Free People dress, Silver c/o Anjolee diamond tennis bracelet, Tan Zara sandal heels, Beige c/o Handbag Heaven Elise shoulder bag. I wanted to create a very feminine romantic outfit yet with a sporty twist. Here I paired this pretty lace dress with my structured moto jacket, interestingly mix of tweed and parka material. 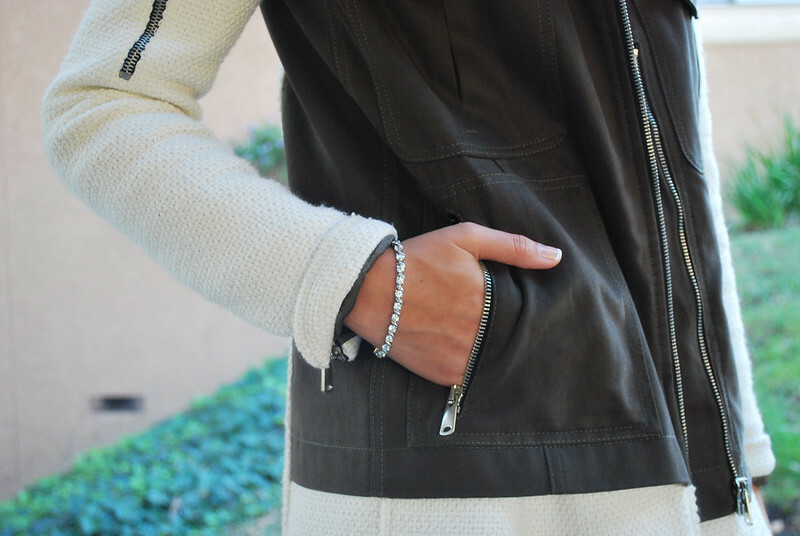 For accessories (my favorite part of styling an outfit), I mixed light neutral tones. I wanted to keep the palette light but with a cool factor with this gorgeous studded bag from Handbag Heaven. I love how it's very spacious inside with a lot of compartments, very ideal for a working girl. In addition, I paired the outfit with a beautiful element, this sparkly number from Anjolee, the diamond bracelet designs. I love how on their website you can also customize the length and size (important for me having tiny baby wrists). This month of October went by so fast! This Thursday for Halloween, I'm planning to go out again with my partner in crime. It'll be a surprise of what we'll be then, follow my instagram to find out! :) This past weekend I had fun going to a Halloween party in the city and visiting a pumpkin patch with the boyfriend. Loving October so far! Next up, Thanksgiving. Hope you lovelies have a safe and fun Halloween! P.S. I'm sooo very excited to share with you all my redesign coming soon by my really good friend Richard, to now Inspirafashionblog.com (btw, the url changed!) And with this redesign, stay tuned for a video (and photos!) by Tim Williams, I'm collaborating with him to bring you guys a fun fashion video to showcase outfits I'm going to style. Can't wait to share with you lovelies. Love the combo of these pieces! You look great! I love the mix of textures.